Naomi Tajitsu for Reuters: Japanese carmaker Honda Motor Co (7267.T) on Thursday spelled out for the first time its plans to develop autonomous cars which can drive on city streets by 2025, building on its strategy to take on rivals in the auto market of the future. 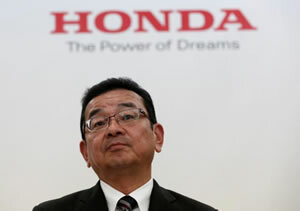 Unveiling its mid-term Vision 2030 strategy plan, Honda said it would boost coordination between R&D, procurement and manufacturing to tame development costs as it acknowledged it must look beyond conventional vehicles to survive in an industry which is moving rapidly into electric and self-driving cars. Honda has already spelled out plans to market a vehicle which can drive itself on highways by 2020, and the new target for city-capable self-driving cars puts its progress slightly behind rivals like BMW (BMWG.DE).